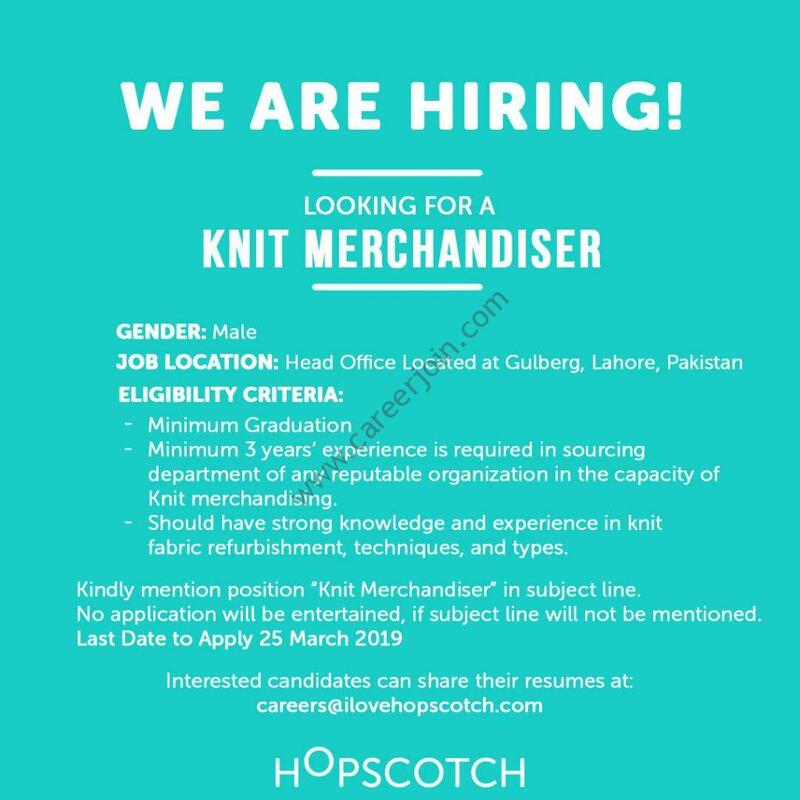 HOPSCOTCH Jobs March 2019:HOPSCOTCH a kids wear brand operating since 2013 with 30 outlets all over Pakistan, is looking for a “Knit Merchandiser” in Sourcing Department. • Minimum 3 years’ experience is required in sourcing department of any reputable organization in the capacity of Knit merchandising. • Should have strong knowledge and experience in knit fabric refurbishment, techniques, and types. Kindly mention position “Knit Merchandiser” in subject line. No application will be entertained, if subject line will not be mentioned. HOPSCOTCH a kids wear brand operating since 2013 with 30 outlets all over Pakistan, is looking for a “Woven Merchandiser” in Sourcing Department. • Minimum 4 years of experience is required in sourcing department of any reputable organization in the capacity of woven merchandising. • Should have strong knowledge and experience in woven fabric refurbishment, techniques, and types. Kindly mention position “Woven Merchandiser” in subject line. No application will be entertained, if subject line will not be mentioned.